A screening of the documentary "Calais Children: a Case to Answer"
Screening of the documentary "Calais Children: a Case to Answer" by local film-maker and campaigner Sue Clayton. Sue has worked on various child and youth asylum projects over 15 years, consulting and producing news stories for ITV and the BBC. 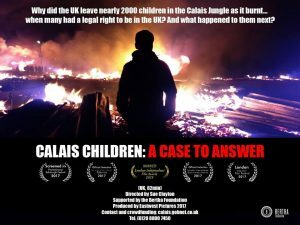 When the Calais Jungle was taken down in 2016, 2000 lone refugee children were left abandoned. Many had a legal right to be in the UK. This film shows what happened.